With the growing number of pet food brands, this month we would like to focus upon selecting the right food for your pet. Our objective is to identify the important elements in the decision-making process. The age of your pet can help you identify the nutritional needs and the pet food that is best for your pet. In response, many pet food manufacturers offer food designed for the age, or life stage, of pets. These foods match caloric and nutritional requirements (protein, fat, vitamins, minerals, and carbohydrates) with the current physiological and activity needs of the pet. For example, puppies and kittens need food higher in proteins, vitamins and calcium to support their growing muscles and bones. Pets between one and six years of age (“Adult”) can consume food that is higher in fat and calories to support an active, energetic lifestyle. But “Senior” pets often require food that is lower in calories, higher in protein and contains nutrients that aid with digestion. If your pet is pregnant or nursing, their nutritional needs will differ, so please feel free to contact us. These life stage-specific foods tend to be well-balanced and designed to meet the nutritional needs of most pets. Often these foods contain claims such as “complete and balanced” which are required to be validated by the pet food manufacturer. To the extent possible, avoid foods marketed as “all life stages” as they often contain excessive levels of nutrients needed for growth but can be inappropriate for adults or seniors. Like our food, the label reveals the ingredients and the overall nutritional composition. Ingredients are listed in descending order by weight — which is typically impacted by the amount of water in each ingredient. Ideally the amount of filler (typically grains) should not be listed as the first ingredient. The label will also display a “Guaranteed Analysis” which represents the percentage of nutritional value (metabolically useful to support life) by weight. A comparison of products using this information requires some calculations to normalize the percentages of each product based upon moisture levels. Importantly, the label will generally indicate a serving size based upon your pet’s weight. The serving size can be compared across products to gauge the relative caloric value of the pet foods. Labels often include “natural” or “organic” descriptors which have precise meanings. “Natural” means all ingredients have not undergone any chemical alterations and do not contain additives or processing aids. “Organic” (vs. “made with organic ingredients”) means at least 95% ingredients (excluding added water or salt) are free from pesticides, artificial fertilizers, genetic modification, irradiation or sewage sludge. The presence of these descriptors may influence the overall price. The choice of dry, wet or a mixture is often one of pet preference. For finicky pets, a rotation of types and flavors can keep mealtime more interesting. Pet owners should be aware that dry food has some additional benefits as the mechanics of chewing dry food can help remove some tarter from your pet’s teeth. So, pets that exclusively eat wet may require more frequent teeth brushing. For pet foods marketed with similar nutritional claims (such as “complete” or “balanced”), there is often little nutritional difference between low/moderately priced foods and that of their “expensive” counterparts. Often manufacturers rely upon marketing to differentiate their products hoping pet owners perceive a price/quality relationship. In our view, there is little need to pay higher prices for pet food unless your pet has a specific allergy or unique dietary need. In these situations, we encourage pet owners to contact us to discuss affordable brands that will address your pet’s specific situation. 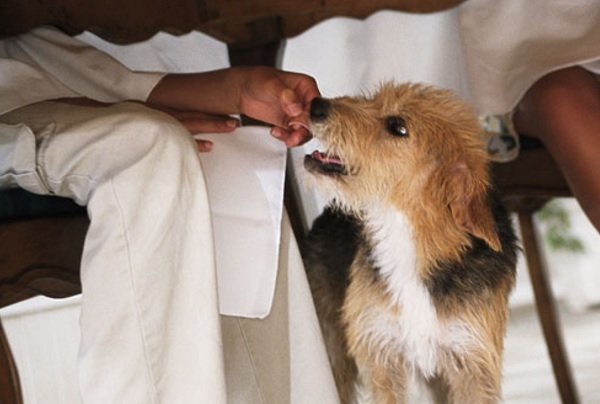 To the extent possible, try to limit the amount of table scraps provided to your pets. Food produced for human consumption tends to have elevated levels of sugar, carbohydrates, salt and additives that are not beneficial for your pet. However, if your diet includes steamed or non-sauced vegetables, feel free to share these vegetables with your pet. Treats are often rewards provided for accomplishing a certain task. But they are also frequently given as “snacks” between meals. We recommend small, low calorie snacks to prevent unnecessary weight gain. We do not recommend rawhide or horn-based chews as they can induce digestive, gum or dental concerns. If you have any questions about your current pet food, or are considering switching brands, please contact us. We would be glad to discuss your pet’s specific dietary needs.